CONTACT US / ORDER NOW! 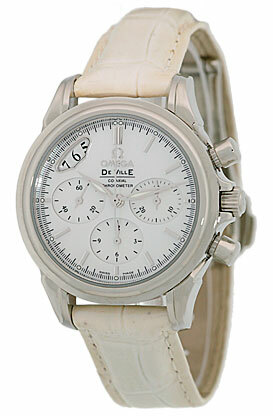 Lady's Stainless Steel Omega "De Ville" Chronograph. 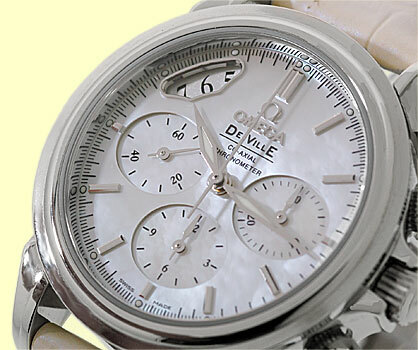 White Mother Of Pearl Dial with Raised Hour Markers, Luminescent Hour and Minute Hands, Date Indicator, Chronograph Functions and Sapphire Crystal. 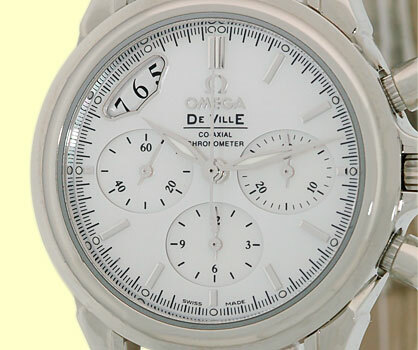 Highest Quality White Perlescent Crocodile Strap with Stainless Steel Omega Deployant Clasp. 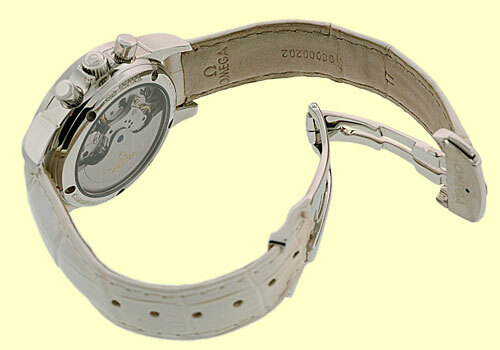 Handmade Swiss Chronometer Co-Axial Automatic Movement Visible Through Sapphire Crystal Exhibition Caseback. 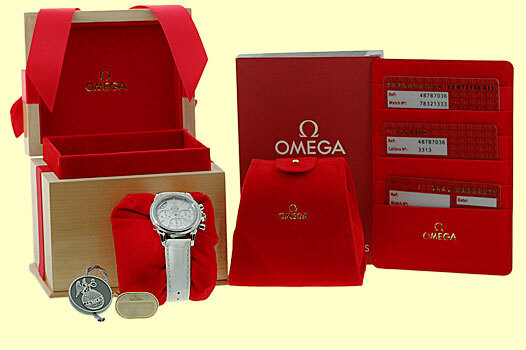 Brand New, Showroom Fresh, with Omega Box, Booklets, Warranty Cards, Hang Tag and complete with Capetown's Lifetime Warranty!! Remember, If we're shipping anywhere outside the state of Georgia, you stand to save even more! As long as we ship out of state, you don't pay sales tax at Capetown. Legitimate Tax Savings of up to 10%! At Capetown, we're always looking for interesting trade-ins toward any purchase, such as your fine watch or upscale jewelry. Please call our purchasing department with any inquiries. Click here for more information.